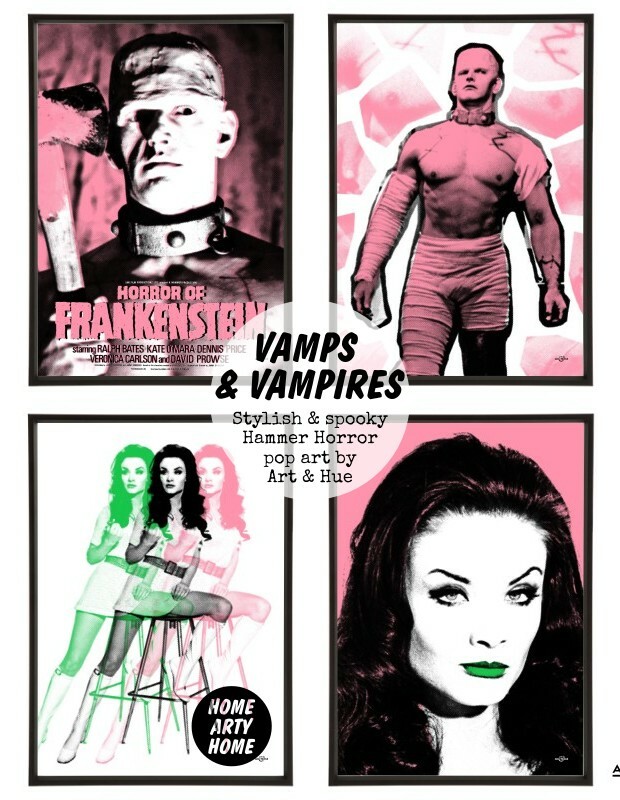 Just in time for Halloween, this new Hammer Horror collection of stylish pop art prints features cult film icons Valerie Leon, Kate O’Mara, Christopher Lee, David Prowse, and Anouska Hempel before she became a hotelier and interior designer. Not just for Halloween however, as these prints make walls stylish year round, ideal for the cult film fan or horror-lover. Before her current incarnation as a stylish hotelier, Antipodean Anouska Hempel descended on Swinging London and promptly secured roles in films and television shows. Lady Weinberg, as she’s now known, had a busy film career in the 1960s and 70s, appearing in a Bond film and as a vampire in “Scars of Dracula”. The Scars of Dracula pop art print features Anouska Hempel with vampire fangs about to take a bite out of Christopher Matthews’ neck, and comes in a wide choice of 22 colours and three sizes. 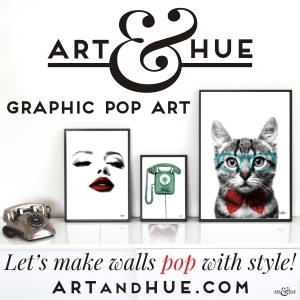 Art & Hue had the pleasure of diving into Studiocanal’s extensive library of production and publicity photography at Pinewood Studios to create this group of exclusive pop art prints in homage to classic Hammer Horror films. If there are three characters that are most associated with classic horror films, it has to be Dracula, Frankenstein, and the Egyptian Mummy. Monsters, mummies & vampires were a winning cinematic combination for British film production company Hammer, and, with a cast of beautiful women, vamps could also be added to the successful formula. 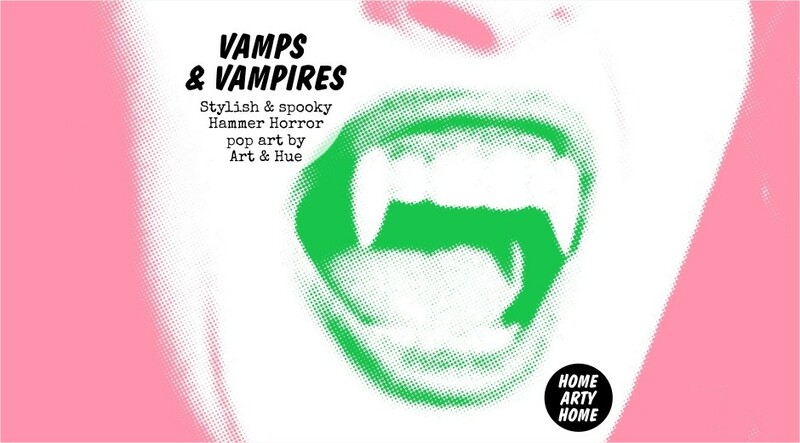 Valerie Leon, Kate O’Mara and Anouska Hempel were some of the vamps who featured in the Hammer films and have inspired Art & Hue’s new collection of stylish pop art prints, which also features strongman David Prowse and horror stalwart Christopher Lee. An official collaboration with Studiocanal, Art & Hue has delved into the archives to pay homage to classic Hammer horror films with this collection of ten stylish pop art prints, in Art & Hue’s signature halftone style, available in a choice of three sizes & 22 colour options. Inspired by the cult 1971 film “Blood from the Mummy’s Tomb”, as well as Hammer’s 1970 double bill of “Scars of Dracula” and “Horror of Frankenstein”, this Art & Hue pop art collection is printed on archival matte card of 310gsm, made from 100% cotton, using fine art pigment inks. Prices start at £15 for A4-size prints up to £39 for A2. See the full Hammer Horror collection at Art & Hue.